Get an early start at Muir Woods National Monument with hotel pickup in the morning. You’ll depart San Francisco, passing the Palace of Fine Arts and the Presidio, for a drive north across the iconic Golden Gate Bridge. Gaze at the city skyline and Alcatraz Island en route to the renowned wine country of Northern California. Enjoy early arrival at Muir Woods, before most other tour groups reach the park. This national monument is the site of a virgin forest of California Coast redwood trees, among the oldest and tallest on Earth. You'll have approximately one hour to admire the groves of giant sequoias. Behold the majestic redwoods as you take a leisurely nature walk with your informative guide, who points out native coastal flora and fauna including ferns, laurel trees and the occasional deer. Cross moss-lined creeks and stand in awe beneath trees that reach 250 feet (76 meters) skyward. Then re-board the vehicle to spend a leisurely afternoon wine tasting at three wineries in Napa Valley and Sonoma County. 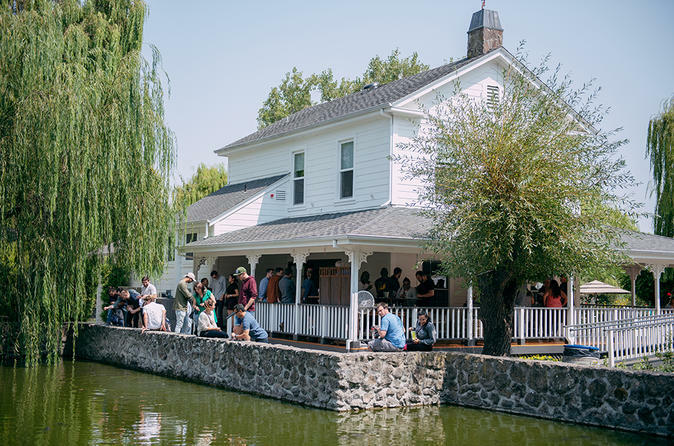 Typical stops include Madonna Estate Winery, Cline Cellars and Mayo Family Winery, but locations are subject to change, depending on availability. You’ll spend up to one hour at each selected winery, with the opportunity to try 3 to 5 delicious wines, enjoy a sparkling wine tasting, and purchase bottled wine to take home. All wine tastings are complimentary! Arrive at your first winery in the Carneros region of Sonoma County, where you'll indulge in a variety of elegant wines. Stroll the winery grounds, take scenic photos among the vines, and enjoy the friendly atmosphere as you enjoy a personalized experience. You have an hour of free time at the Sonoma Plaza to purchase lunch, browse the boutiques or enjoy additional wine tasting at the many tasting rooms (fees not included), before sipping more California varietals at your second and third winery, including Napa Valley. Then relax on the return journey over the Golden Gate Bridge, enjoying sweeping views of the San Francisco Bay and seaside cliffs before hotel drop-off. Enjoy an exclusive three course gourmet food and wine pairing!